RIO DE JANEIRO, Jan 31 2013 (IPS) - The execution-style killing of a leader of the Landless Workers’ Movement in a sugarcane plantation in the southeastern Brazilian state of Rio de Janeiro, where bodies of opponents of the dictatorship were incinerated in the 1970s, recalls one of the most tragic chapters in this country’s history. Cícero Guedes, murdered Jan. 26 in the north of Rio de Janeiro. In the book “Memórias de uma Guerra Suja” (Memoirs of a Dirty War), Cláudio Guerra, formerly an agent of the Departamento de Ordem Política e Social (DOPS), the 1964-1985 military regime’s political police, tells how the bodies of 10 leftwing activists were burned, in order to leave no trace, in the oven of the Usina Cambahyba sugarcane plant in Campos dos Goytacazes, a municipality in the north of the state of Rio de Janeiro. Forty years later, the name of this agroindustrial complex of seven plantations with a total area of 3,500 hectares is again linked to the silencing of a bothersome voice, but this time under a full democracy. Fifty-four-year-old Cícero Guedes was an outstanding leader in the Landless Rural Workers Movement (MST). He led the land occupation of the Usina Cambahyba plant which gave rise to the Luiz Maranhão encampment. “He was a real symbol, and (his murder) sends a powerful message to the MST, which is organising the land claims of rural workers in the area,” one of the MST national directors, Marcelo Durão, told IPS. Marcos Pedlowski, a professor at the State University of North Fluminense who has studied land reform issues there since 1998, said the murder “is clearly an attempt to break up the organisation, rather than a petty dispute.” Guedes was “an icon of efforts in the struggle for land”, he said. The MST leader was cut down by at least 10 bullets in an ambush in the pre-dawn hours of Jan. 26, near the sugarcane industrial complex. He was cycling home from a meeting to negotiate the legalisation of the situation of the 100 landless families in the encampment. The dispute over land ownership with agribusiness owners in the region “has been exacerbated by the delay in legal procedures involving properties regarded as unproductive, and therefore subject to expropriation for agrarian reform purposes,” said Maria do Rosário Nunes, the human rights secretary for the Brazilian Presidency. The Cambahyba case is an example, she said in a communiqué. Legal authorisation for the expropriation, which effectively allows it to go ahead, was granted in August 2012, 14 years after the ruling by the Institute for Colonisation and Agrarian Reform (INCRA). “The backdrop (to the murder) is the slowness of federal justice,” Marcelo Freixo, a state legislator for the Socialism and Freedom Party and chair of the Human Rights Commission of the Rio de Janeiro state legislature, told IPS in an interview. “The large plantations in the sugarcane processing region are bankrupt and are in debt to the state, in an area where there is a great concentration of poor and landless people. This is where INCRA really has to ensure land reform,” he said. The large estates belonged to the late Heli Ribeiro Gomes, a former deputy governor of Rio de Janeiro, and were passed on to his heirs. In the book, Guerra says he took advantage of his friendship with Ribeiro Gomes to “disappear” the bodies of the leftwing activists, using the factory oven. The story is “absurd”, according to Ribeiro Gomes’s relatives, but other equally macabre tales have been borne out in reality, even in the present day, like the killing of Guedes and other rural activists whose deaths did not receive as much publicity. “They say 10 activists were cremated. But we can well believe there were many more,” said Durão. The area is notorious for its history of violence against rural workers on the part of the “sugar kings” and their hired killers. Durão drew attention to the “brutality” of the killing, and its “premeditated nature”, with four shots to the head and six to the left side of the chest. The northern part of the Fluminense flats has not changed much – at least in terms of fundamental issues like land ownership, human exploitation and violence – since the dictatorship era, nor since previous centuries, when the first forms of slavery in Brazil were introduced on sugarcane plantations. In 2009, a Labour Ministry report said Campos dos Goytacazes was the area with the highest number of workers labouring in slave-like conditions, a shocking situation in the 21st century, Freixo said. However, it is not surprising, since this region was the last in the country to abolish slavery. Pedlowski, author of the book “Desconstruindo o Latifúndio – a Saga da Reforma Agrária no Norte Fluminense” (Dismantling the Large Estates – the Saga of Land Reform in North Fluminense), stressed the concentration of land ownership, linked to sugarcane monoculture and violence. The Gini coefficient, which measures inequality on a rising scale from 0 to 1, is 0.8 for land ownership in Campos dos Goytacazes, the highest inequality coefficient in the state of Rio de Janeiro. “The same families always rule the roost in Campos,” a region that is “the traditional cradle of the extreme right, like Tradition, Family and Property (TFP, a traditional Catholic civic organisation, now-dissolved),” and a place where political corruption scandals have erupted in modern times, the book says. Guedes fought tirelessly against the use of toxic pesticides in agriculture, in addition to fighting injustice. 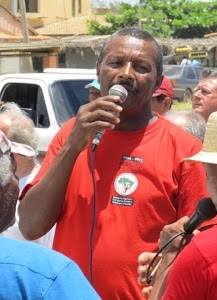 He was a sugarcane cutter in the northern state of Alagoas before joining MST in 1996 and obtaining a plot of land in the Zumbi dos Palmares settlement. A father of five, Guedes ran an agroecological farm and was regularly to be found at organic produce markets, as well as participating in local coordination with the government food purchasing programme, which buys produce from family farms to provide school meals. “He did not learn at the university. The rest of us learned from him,” Pedlowski said. “The MST was his life. He made great sacrifices to form marketing groups for producers…and he was not satisfied with having his own land. He led from the front at other land occupations. He was the animator,” he said. “The elimination of such a dynamic leader shows the degree of impunity and the state of paralysis of land reform, especially since (Brazilian President) Dilma (Rousseff) took office,” he said. According to the MST, the current administration not only has not solved the problem of 150,000 families camped by the roadside waiting for land, but has increased the concentration of land ownership, some of it in the hands of foreign companies. An INCRA report says that in 2012 the agency invested 1.05 billion dollars and benefited 23,000 families in 117 settlements. Last year, it says, the agency obtained declarations of public interest on 31 properties for the purposes of land reform. This si terrible crime without punishment! What democratic president Dilma Rusef does?